The cost of living keeps going up, but new Statistics Canada data shows that slow earnings growth means pay raises aren’t keeping up with inflation. The latest Survey of Employment, Payrolls and Hours (SEPH) tells the story of slow earnings growth in Canada. 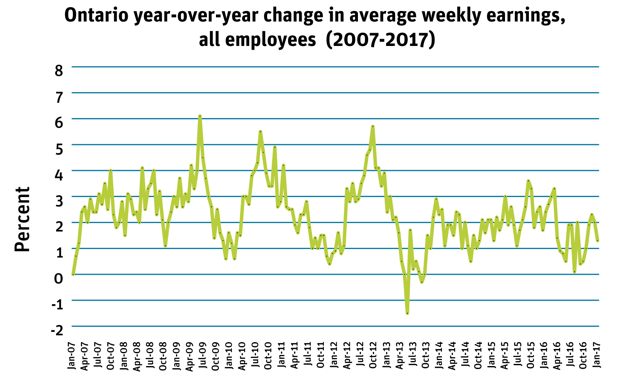 Average weekly Canadian earnings have not changed much between the months of February and March of this year. But looking at average weekly earnings in Canada over the past year (March 2016 to March 2017) shows earnings only grew by 0.9 per cent — less than inflation. 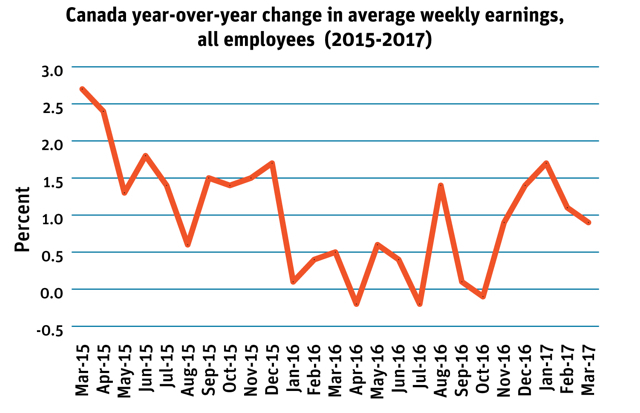 This sad chart, which looks at average weekly earnings between 2015 and 2017, shows you what slow earnings growth looks like in Canada. The story of slow earnings growth looks different depending on where you live, and it’s important to step back and look at the big picture. What’s happened over the past year in Canadian provinces (March 2016 to March 2017)? Payroll data shows that average weekly earnings grew in six provinces: Newfoundland (2.9 per cent), Saskatchewan (2.6 per cent), Manitoba (2.4 per cent), British Columbia (1.9 per cent), Ontario (1.3 per cent), and Prince Edward Island (0.9 per cent). 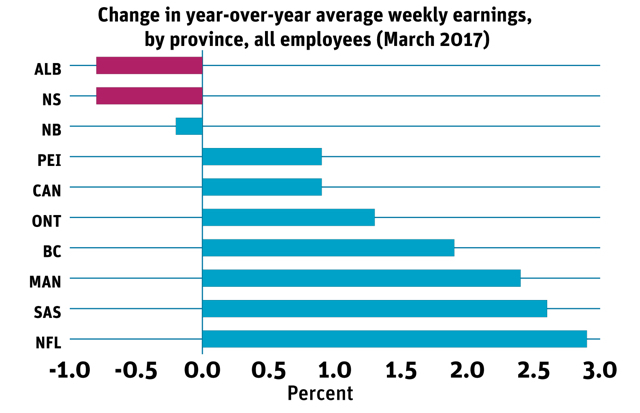 But average weekly earnings dropped in three provinces: New Brunswick (-0.2 per cent), Nova Scotia (-0.8 per cent), and Alberta (-0.8 per cent). Newfoundland, Saskatchewan, and Manitoba registered the fastest earnings growth over this period while New Brunswick, Nova Scotia, and Alberta saw a drop in earnings. Among the provinces with year-over-year earnings growth gains, Ontario ranks among the lowest, at 1.3 per cent—just slightly above Prince Edward Island. Earnings growth in Ontario has displayed weakness in the last decade. Since 2010, when growth in average weekly earnings reached 5.7 per cent, earnings growth has decelerated. 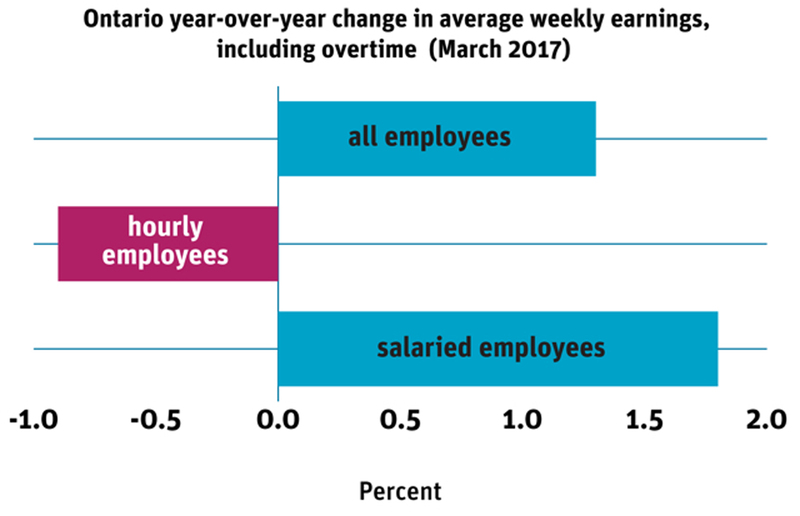 In Ontario, earnings of hourly employees moved in a different direction than salaried employees. Average weekly earnings for salaried employees rose by 1.8 per cent, whereas average weekly earnings of hourly employees fell by 0.9 per cent. Not only is there evidence of earnings stagnating for Ontarians who are paid on an hourly basis, but it also shows a sharp year-over-year drop for Ontarians who work in industries such as utilities (-9.4 per cent), finance and insurance (-3 per cent), real estate and rental and leasing (-6.5 per cent), management of companies and enterprises (-1.6 per cent), and public administration (-2.3 per cent). These are big swings in the data, which we will be watching closely to determine whether they represent a continuing trend. Either way, it looks like Canada—and Ontario—needs a pay raise. Zohra Jamasi is an economist with the Canadian Centre for Policy Alternatives’ Ontario office. Follow Zohra on Twitter: @ZohraJamasi.